100% AUTHENTIC ZARA BASIC COLLECTION REF: 6318/029. 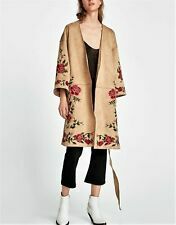 BEIGE SUEDE EFFECT WRAP KIMONO STYLE COAT JACKET WITH FLORAL EMBROIDERY. main fabric - 90% polyester, 10% elastane. embroidery - 100% polyester. lining - 100% polyester. Zara Floral Kimono S/M. Condition is New with tags. Shipped with USPS First Class Package. Gorgeous satin V-neck floral duster with contrasting piping, long slits at the hem and fabric belt that fastens in the front. 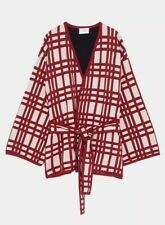 NWT Zara Checked Check Kimono Jacket With Belt Beige Red Size M Medium. Condition is New with tags. Shipped with USPS First Class Package. Has a couple of snags here and there. I try my best to state the flaws and imperfections of each item. •length about 50”. Gorgeous handmade jacket with embroidery and bead detailing. 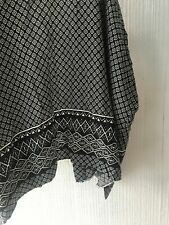 Sleeve length 20". Length 24”. Brand new Zara Velvet belted kimono with long sleeves- original price $129! In perfect condition/ never worn! NOTE it’s missing it’s Belt! In my opinion still a lovely piece! 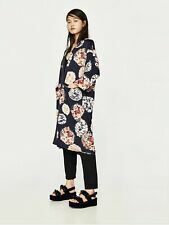 NWT Zara TRF Collection Blue Floral Kimono in size Medium. Pattern: Aztec, Ethnic Print. Style Type: Bohemian, Kimono Style, Open Front. front length (top of shoulder to hem) 32" including fringe. back length (top of shoulder to hem) 32" including fringe. Main Fabric 44% Cotton, 26% Polyester, 11% Viscose, 10% Acrylic, 5% Nylon, 4% Wool. Features kimono sleeves, pom pom details, fringe detail, and removable woven tie belt. Open front. ▪️ Approx. 20.5" armpit to armpit ▪️ Approx. Condition is used, but good. Zip up front and drawstring around the bottom. Zara Green Cape Kimono Cardigan Size Large. Condition is New with tags. Light Blue with Floral Boucle. Oversize / Slouch Fit. Kimono Trench Duster Coat. Shoulder to Shoulder - 28.5. 3/4 Sleeve. Sleeve - 11.75. Mid-thigh Length. Length - 31. Zara Boho Cream Beige Fringe Short Sleeve Jacket Vest Size S. Design: Boho Fringe Short Sleeve Jacket Vest. Color: Cream Beige. Sleeves: Short. Length: 32" at the back. Beautiful raised jacquard floral kimono. Kimono open front. Navy with multicolored embroidery. Shoulder to sleeve hem 20" in. 100% cotton. size small. Velvet blush pink color. polyester, elastane, polyamide. Kimono with a crossover V neck and high collar. 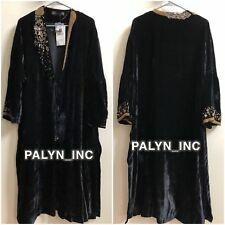 Long sleeves Front welt pockets Asymmetrical hem Button in front Color: Black New with tag Size: medium Zara Blazer Jacquard Kimono Black Jacket Medium. Condition is New with tags. Shipped with USPS Priority Mail.